With so many dog beds on the market, deciding which one is best for your pet can be a real challenge. Different styles fulfill different purposes, and some even provide therapeutic benefits. It's best to take a look at a variety of styles before you invest in a bed that you can be sure will deliver the comfort your pet needs. 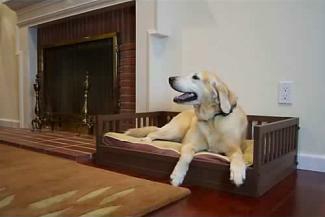 Basic dog beds provide pets with a place to sleep. Styles vary from simple cushions to cuddlers to beds that look like furniture, but all of them offer comfort from the bare floor. They're a good choice for dogs that don't have any special needs, but even some special needs dogs can use them, depending on the design. The Deluxe Warm and Cuddly Slumber Ball offers cushy comfort. It's filled with polyfill that never packs down, so your pet sinks in and is snuggled all the way around. Cover details: The cover comes in a waffle-weave fabric with your choice of color in chocolate, safe, buff or scarlet. The cover and liner are machine washable. Price: Prices range by size from $35 to $135. Reviews: Customers who have purchased the item from Doctors Foster and Smith (link above) give the bed an average rating of 4.5 out of 5 stars. 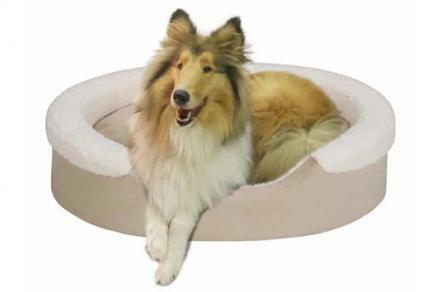 Most praise the bed's quality and the fact that their dogs love it, but at least one customer advises that this bed is difficult for smaller dogs. The Soft Touch Faux Suede Oval Cuddler has a foam cushion that's surrounded with a raised back and sides. It's a nice choice for most dogs, and even dogs with joint pain can use it, although they may have more difficulty climbing in and out. Sizes: This bed is available in three sizes, including 14" x 18", 27" x 21", and 36" x 24". Cover details: The base of the bed is covered in tan faux suede, and the inside is made of fluffy micro berber. 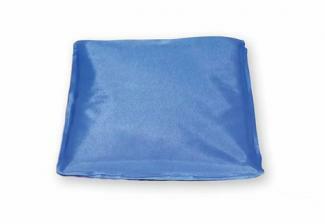 Both the cover and the cushion are machine washable. Price: The smallest bed is priced just over $20, while the medium-size bed sells for about $38. The large bed runs about $57. Reviews: Customers give this bed an overall 5 out of 5 stars. Positive comments praise the quality of the bed, as well as its durability and comfort. One customer thought the cushion should offer better support. Orthopedic beds protect a dog's joints, so they're a great choice for older pets, as well as pets that display signs of arthritis or hip and elbow dysplasia. They're even suitable for dogs recovering from surgery. Simmons is a well-known name in mattresses, and the company applies some of the same technology to their orthopedic dog beds as well. The ComforPedic Lounger's core is made from orthopedic foam that offers plenty of support and comfort. The bed has raised sides, which makes it nice for a dog to cuddle into, but the front side is still low enough for almost any dog to step into easily. Size: Unfortunately, the ComforPedic Lounger only comes in one size, but it's still fairly roomy. The bed measures 34" x 24" x 10". Cover details: The outer cover features a wavy, cream-colored pattern laid over a tan background, while the inside of the bed is covered in dark brown plush. The entire cover unzips for washing. Price: The price of this bed averages about $90. 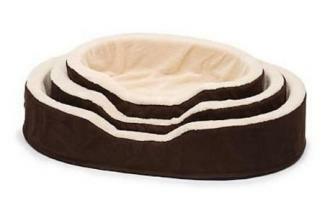 Reviews: There aren't many customer reviews available, but the bed received a 5 out of 5 rating at Petco (link above) because it's comfortable and roomy. This Tempur-Pedic Lounger's cushion is made from memory foam, so it doesn't create pressure points for your dog's joints. Memory foam is also odor resistant, so it won't develop a "doggy" smell, and it also retains your dog's body heat to help him stay warm. The bed also comes with a water-resistant liner, which is especially helpful for older dogs that may also be incontinent. Sizes : Sizes range from small, which can fit dogs up to 40 pounds, to extra large, which can accommodate dogs over 100 pounds. Cover details: You can choose from nine different colors and patterns, including beige, sage, slate, field tartan, and brown tweed. The cover can be removed and washed. Price: Prices range from approximately $150 for a small size bed to around $260 for the extra-large bed. Reviews: Customers from Orvis (link to the right) give the bed an overall 4.6 out of 5 stars, so it's likely worth the investment. Most customers feel the bed is high quality and offers great support, while a few customers disagreed about the level of support and also felt the sizing on the beds wasn't really correct. According to Allen M. Schoen, D.V.M., M.S., there may be some benefits to providing a dog with a magnetic bed. The magnets may encourage healing and increase circulation and mobility in dogs that suffer from arthritis. 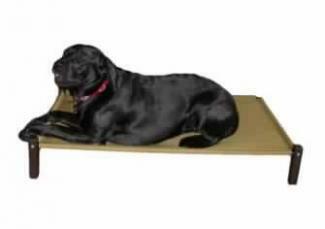 The Magna-Mat can be used as a bed by itself or inserted into an another dog bed. It's made of two layers of foam, and ceramic unipolar magnets are anchored between the layers. This bed has no sides, so it's easy for any pet to climb in and out. Sizes: This bed comes in three sizes. The small bed measures 22" x 30" x 3-1/4", the medium bed measures 24" x 36" x 3-1/4", and the large bed measures Large 36" x 44" x 3-1/4". Cover details: The top of the cover is made from polylambswool, while the bottom and sides are made from water-resistant polyester. The entire cover unzips so you can wash it. Price: Prices range by size. The small bed runs just under $80, the medium bed is priced just over $100, and the large costs about $170. Reviews: There were no independent customer reviews available at the time of this writing, but there are highly favorable customer testimonials listed on the Magna-Mat website. Many customers claim to see an increase in their pet's level of mobility after using the bed for a few weeks. The TheraPetic Magnetic Dog Bed uses a Thera-Core™ foam core with ceramic, bio-north polarity magnets inserted between the layers. The number of magnets used depends on the size of the bed. This is a mat-style bed with no raised sides, so it easy for even the most arthritic or dysplastic dogs to use. Sizes: This bed comes in four sizes which range from a small bed, measuring 17" x 23" x 2", to a large bed, which measures 26" x 41" x 2". Cover details: The top of the cover is made from shearling, the bottom is a polyester and cotton blend, and it's washable. Price: The price ranges from about $100 for the small bed to approximately $200 for the extra large bed. Reviews: Customers give the bed a solid 5 out of 5 rating for the product's quality, comfort, effectiveness, and value. Heated pet beds can keep any pet comfy and warm, especially those with less fur, but heat therapy can also help ease joint pain. Some beds heat using electricity, while others warm up by retaining a dog's body heat. 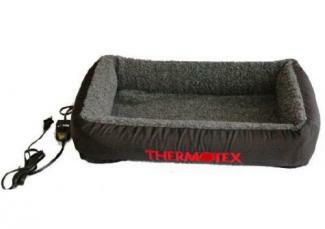 The Thermotex Therapeutic Pet Bed provides radiant heat via a heating pad inserted beneath the cover. The bed has raised sides all around, which could make it a little more difficult for pets with low mobility to get in and out. 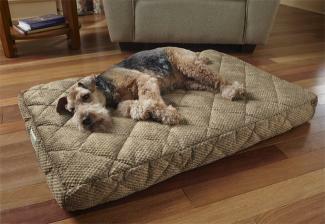 Thermotex also offers a mat-style bed that's suitable for dogs that find it difficult to step over raised sides. 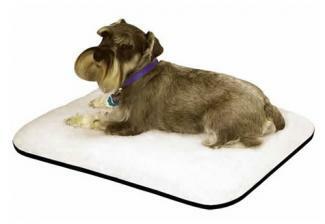 The mat bed is also a good choice for larger dogs that can't fit into the bed with raised sides. Sizes: The bed is only available in sizes small and large. Size small measures 11" x 13" x 4", and the large size measures 12" x 20" x 4". Cover details: The charcoal-colored cloth cover is washable, and so is the bed itself. However, you need to open the Velcro closure and remove the heating pad before laundering. The company recommends air drying the bed instead of placing it in a dryer. Price: The small bed is approximately $160, and the large bed runs about $190. The company also offers free shipping. Reviews: There were no customer reviews available at the time of this writing. If you prefer a bed that doesn't use electricity, consider a self-heating bed. The Deluxe Self-Warming Bolster Bed has an inner thermal layer beneath the plush cover that holds a dog's body heat. The bolster surrounds the bed on three sides, leaving the front open for a dog to step into. The bed is quite cushy so pets need to step up into it, and this could require a bit more work for dogs with severe joint issues. Sizes: This bed comes in three sizes. The small bed measures 28" x 22", the medium bed measures 36" x 26", and the large bed measures Large 45" x 32". Cover details: The cover features paw prints, and it's available in charcoal, olive, and taupe. It's made from a polyester/cotton blend, and it can be removed and washed. Price: The small bed runs about $70, the medium bed is about $80, and the large bed costs about $90. Reviews: Overall, customers (link above) rate this bed 4.4 out 5. Most say their dogs really love bed, the sizing is generous, and the self-warming layer works well. Some complained that the bolster doesn't maintain its loft. When the weather turns hot, a cooling bed can be a life saver. Most of these beds are designed for outdoor use, but there's no reason you can't use them inside as well. 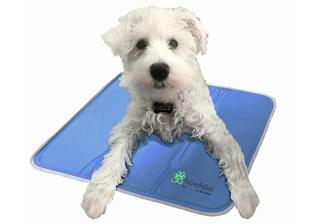 The Green Pet Self-Cooling Pet Pad is pressure activated, and it will cool a dog for up to four hours at a time. Give the pad a brief break, and it's ready to begin cooling again. The manufacturer also claims the pad offers enough cushion to provide comfort for pets with joint pain issues. Sizes: The pad is available in four sizes. The small measures 11.8" x 15.7", and the medium measures 15.7" x 19.7". The large measures 23.6" x 35", and the extra large measures 27.4" x 45". Cover details: The pad is only available in blue, and it wipes clean. Price: Prices vary by size and range from just over $30 to just over $70. Reviews: There was only one review (link above) available at the time of this writing, but the customer gave the bed a full 5 stars and praised its performance for his outside dog. The Cool Lounger has a cool gel insert that lasts for up to eight hours. Simply put the pack in your freezer until it's completely chilled, and then put it back inside the bed. Extra inserts are available, so you can always have one chilling in the freezer while you use the other one in the bed. Sizes: This bed is available in a 25" x 32" size and a 32" x 46" size. Cover details: The quilted, chocolate-colored cover is made of water-resistant polyester, which is also UV rated. The bed can be machine washed in cold water after removing the gel insert. You can either line dry the bed, or put it in the dryer on a no-heat setting. Price: The medium size sells for approximately $120. The large bed sells for about $190. Reviews: Unfortunately, there were no customer reviews available at the time of this writing. Raised beds keep dogs away from floor drafts and cold, damp surfaces. Some styles even let air circulate beneath the bed so they're a good option for outdoor use since they can help dogs cool off, and they dry more quickly if they get wet. These beds are suitable for most dogs, but they may not be the ideal choice for pets with joint problems. The Kuranda Classic Dog Cot has an aluminum and steel frame that supports a durable fabric panel. Sizes: The bed is available in several sizes, including 23" x 35" x 6", 25" x 40" x 6", and 27" x 44" x 6". Cover details: The fabric panel is available in vinyl weave or ballistic nylon, and there are 10 colors to choose from, including blue, sierra, burgundy and gold. Simply wipe it clean, or hose it off, and let it air dry. Price: Prices begin just over $70 and range up to about $90 for the largest size. Reviews: Customers rate (link above) the bed an average of 4 out of 5, and they praise its durability and the fact that most of their dogs seem to like it. The Mission Style Bunk Bed looks like real furniture and eco-friendly with an ecoFLEX frame. Sizes: The bed is measures 20.1" L x 28.7" w x 8.7" H and the cover measures 19.0" L x 26.5" W x 3.5" H. It is recommended for dogs up to 50 pounds. Cover details: The cover does not detach from the cushion. Hand washing is recommended, but the cushion can be machine washed in cold water on a gentle cycle, and then allowed to air dry on a flat surface. Price: The bed runs just under $90. Before you purchase any bed, take time to evaluate your pet's needs, and compare them to the various beds available. There's bound to be a match that finds the happy medium between style, quality and price. As long as you take your pet's physical strengths and limitations into consideration, it's difficult to go wrong.